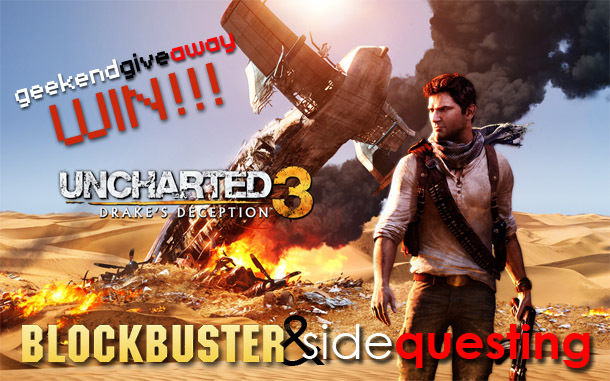 Blockbuster and SideQuesting are offering two copies of Uncharted 3! We know you enjoyed our joint giveaway with Blockbuster for copies of Battlefield 3. In fact, over 100 of you enjoyed it! In case you missed it, Blockbuster is running a killer promotion through November 22nd where if you order a copy of Uncharted 3 from your favorite Blockbuster store then you’ll get a free month of game & movie rentals! You could rent the first two epic Uncharted games to catch up, or perhaps grab Battlefield 3, or Kirby’s Return to Dreamland, or SKYRIM. By entering our second Geekend Giveaway of the weekend, you’ll have the opportunity to win one of two copies of the game for the PS3, provided by our friends at Blockbuster! That’s right, TWO people will win! And how do you win? Leave a comment, of course! In your comment, tell us what was the last game or movie that you’d rented. That’s it! And you have 3 chances to win, too! Starting today (Sunday, Nov 6th) and running through Tuesday Nov 8th at 11:59PM EDT Eastern (8:59PM PDT Pacific) leave your comment below. Open to US residents only. Contest starts Today, Sunday November 6th, and ends on Tuesday, November 8th at 11:59PM EDT (Eastern time)/ 8:59PM PDT (Pacific). Leave a comment on this post up to once per day, Sunday to Tuesday, for a total of 3 chances to win. Winners selected by SideQuesting on Wednesday morning, November 9th, around 12:00AM EDT. Two winners will be selected. Winner receives the standard edition of Uncharted 3 for the Playstation 3.